If wholesome, fresh, organic foods are good for us, they must be good for our furry friends, too. Right? Karen Benker has no doubt. An animal lover turned biscuit baker, she spends most of her waking hours making natural, handmade dog treats for eight pet stores in Colorado. “I don’t have time to grow things. 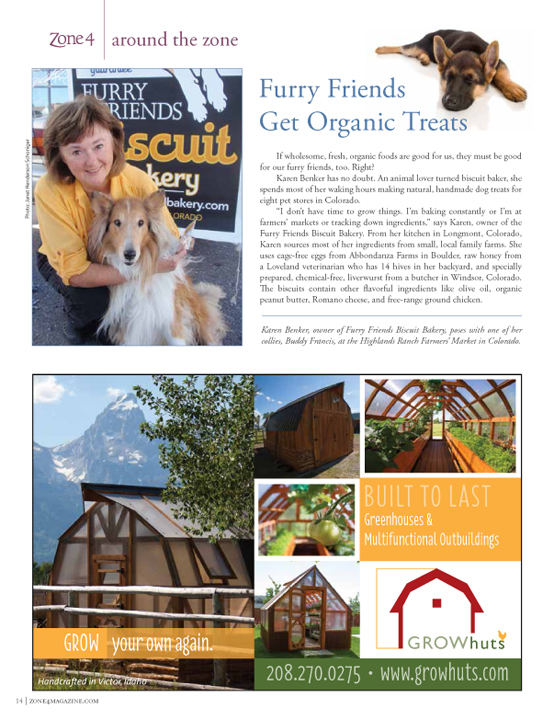 I’m baking constantly or I’m at farmers’ markets or tracking down ingredients,” says Karen, owner of the Furry Friends Biscuit Bakery. From her kitchen in Longmont, Colorado, Karen sources most of her ingredients from small, local family farms. She uses cage-free eggs from Abbondanza Farms in Boulder, raw honey from a Loveland veterinarian who has 14 hives in her backyard, and specially prepared, chemical-free, liverwurst from a butcher in Windsor, Colorado. The biscuits contain other flavorful ingredients like olive oil, organic peanut butter, Romano cheese, and free-range ground chicken. But it’s not all about using the best ingredients. “As a cofounder of a local animal shelter, lost and homeless dogs have a special place in my heart, and that’s why you’ll find a heart biscuit in every bag,” Karen explains. She’s fostered more than 30 dogs. “While I recognize that the first year or so of my business will not realize a profit, my dream is to ultimately donate all of the net profits to Colorado Humane Societies and other animal welfare organizations. 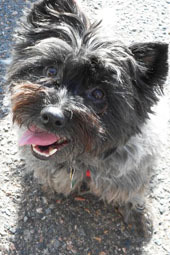 In the meantime, I donate regularly to Colorado animal shelters from the proceeds of the biscuit sales,” Karen says. She may soon fulfill her dream. Demand continues to grow for Karen’s dog treats. 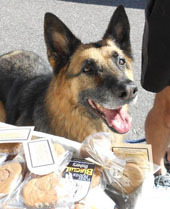 Chelsea Kent, owner of Littleton’s Hero’s Pet Supplies, has sold the biscuits for about a year. “The response has been awesome,” says Chelsea, who only sells natural and earthfriendly products, and applies stringent standards to her suppliers. 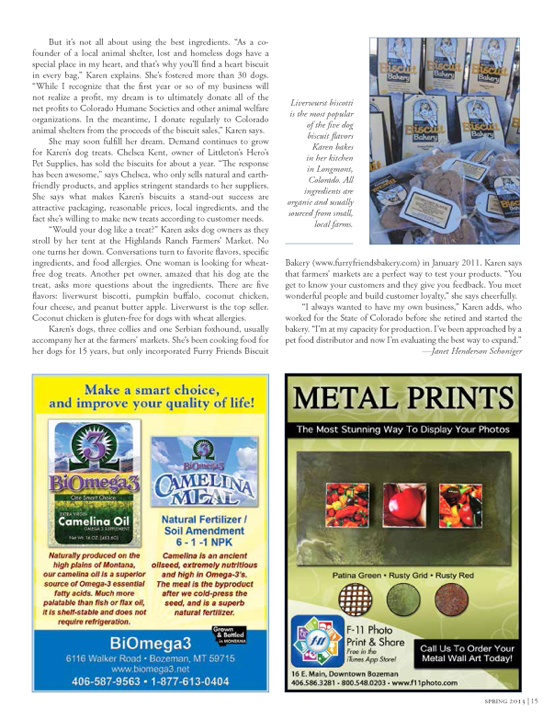 She says what makes Karen’s biscuits a stand-out success are attractive packaging, reasonable prices, local ingredients, and the fact she’s willing to make new treats according to customer needs. 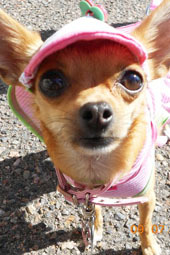 “Would your dog like a treat?” Karen asks dog owners as they stroll by her tent at the Highlands Ranch Farmers’ Market. No one turns her down. Conversations turn to favorite flavors, specific ingredients, and food allergies. One woman is looking for wheatfree dog treats. Another pet owner, amazed that his dog ate the treat, asks more questions about the ingredients. There are five flavors: liverwurst biscotti, pumpkin buffalo, coconut chicken, four cheese, and peanut butter apple. Liverwurst is the top seller. Coconut chicken is gluten-free for dogs with wheat allergies.